This year has been full of news for Fiat. It started with the expected announcement of the final merge between Fiat and Chrysler groups. Then the new name and the headquarters. Then came the presentation of the industrial plan 2015-2018. This all happened at the same time Maserati experiences its best sales results ever, and Jeep is heading to the 1-million sales target. By the end of June the situation was quite the same: FCA continues to struggle in Europe, while it faces tougher times in Brazil, and continous positive growth in North America. But Sergio Marchionne’s goals are clear: the group must able to produce 7 million units by 2018, up a massive 59% from 4,4 million sold last year. Nevertheless its will and the great potential brands such as Maserati, Jeep or Alfa Romeo have, it is clear that to reach such numbers the group must improve its position in Asia. One of the main pilars of the expected growth for FCA is Asia. The group wants to sell 1,1 million units by 2018, up 228% from what it is expected to sell this year. Jeep is going to play a keyrole while Chrysler brand isn’t supposed to shine. Taken from the FCA Investor day 2014 presentation. How to do it? the best and faster way would be with a another partner, and better if it is Asian. Suzuki was supposed to be the best candidate, but its ownership problems with Volkswagen ruined a possible marriage. Despite the hard task that means to gain market share in some Asian markets, FCA has been working hard (but not fast) reinventing its business model in India and starting local production of 2 cars for the Chinese market. The next step will be to give Jeep the protagonism it deserves over there. But based on the latest news it seems that a new partner is right in the corner, and it could play a key role on FCA plans in China and ASEAN markets. Based on 2018 plan, Fiat Professional is planning to sell 600k units by 2018. 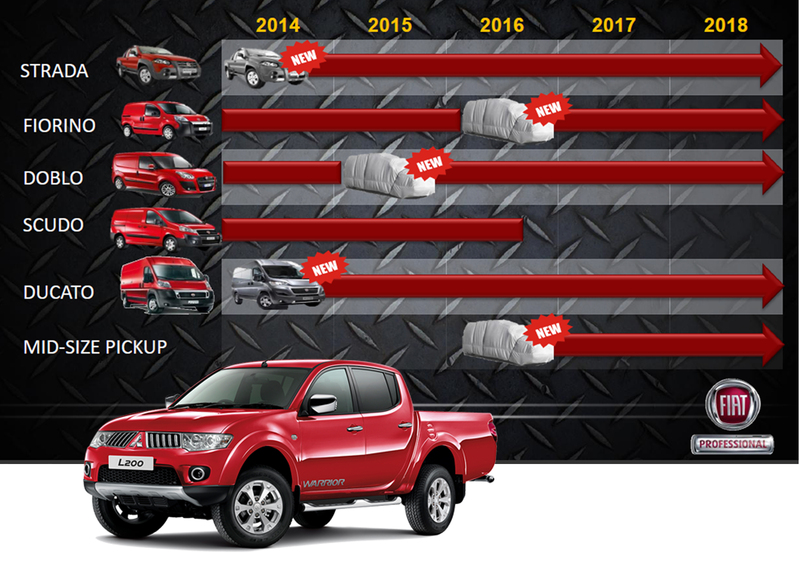 Part of those numbers must come from a new product: the mid-size pickup that will be based on the next Mitsubishi L200 generation. Taken from the FCA Investor day presentation, May 2014. Last month Mitsubishi and FCA announced that the Japanese automaker will provide Fiat with a variant of its L200 pickup to fill the demand on the mid-size pickup segment in Europe and Latin America. A ‘larger Strada’ was twice promised by Marchionne as the RAM Dakota ended its production many years ago. The group is the leader in the small pickup segment with the Strada model in Latin America under Fiat brand, and in Europe under Fiat Professional unit. The Strada was Fiat’s second best-selling nameplate in Brazil in 2014-H1, improving sales registrations by 29%. However, the brand is not present in the mid-size pickup segment, where more than 80.000 units were sold in the first half of this year, down 6% in a market that falled 7% during that period. 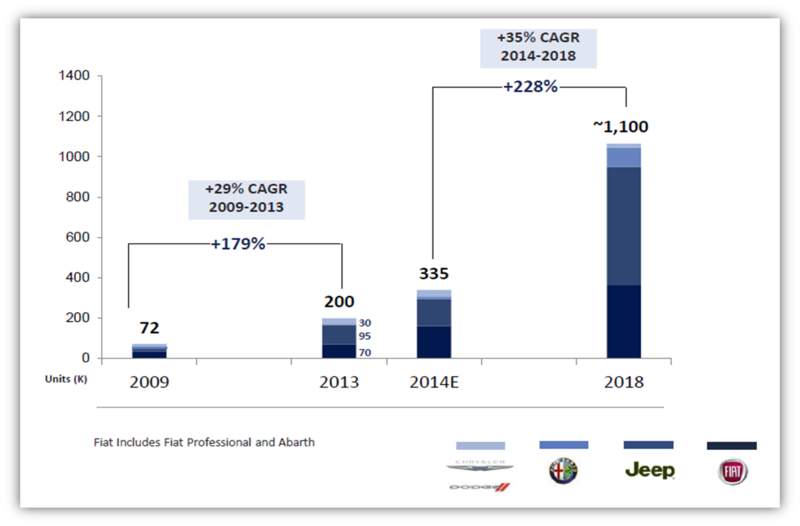 Even if this segment is heavily dominated by Japanese and American brands, Fiat has a clear opportunity in it. Now with agreement, it isn’t clear whether Fiat will use Mitsubishi CKD to assembly the pickup at its plants in Brazil, or will it be imported directly from Thailand, where the L200 is produced. The new pickup is expected to hit the markets in 2016 and will be based on the L200 next generation. 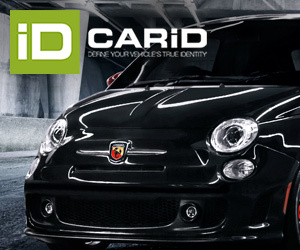 It will help Fiat Professional to achieve its goal of selling 600.000 units by the year 2018. The 2014 Mitsubishi Attrage, which is the sedan version of the Space Star will be rebadged under Chrysler brand for Mexican and China/ASEAN markets. This will help the brand to become more visible in Asia and maintain its market share in Mexico. Some weeks after the pickup agreement, both groups communicated that the Japanese will provide another of its Thailand production made models to FCA. This time they were talking about the Attrage, the small B-Sedan based on the Space Star (in Europe). The idea is that this car will become part of Chrysler brand’s range so it can enlarge its operations in China and in Southeast Asian markets (despite the fact that during the Investor day presentation, the APAC chapter (Asia Pacific region) didn’t show a B-Sedan in its expansion of product portfolio in China (they showed only 2 new models, the 300 and Grand Voyager). But this ‘Chrysler’ will be exported overseas. The third big announcement concerns Mexico and Chrysler position over there. The group, which is Mexico’s 5th largest car maker and is facing very tough times (sales dropped 15% in Jan-May 2014 in a market that down only 0,5%), needs fresh small products as the partnership it had with Hyundai to distribute the small Atos and Attitude has expired. As Fiat Brazilian cars aren’t popular in Mexico, and European-made are quite expensive, the group wants a competitive and cheap product to keep its position in the B-Segment. In this way, Mitsubishi can better use its Thailand output while FCA can make use of a small, modern and cheap car without investing on its development. But what do all these announcements mean? are we heading into a new deal between both car makers? the idea itself seems to have sense. FCA needs more presence in Asia. 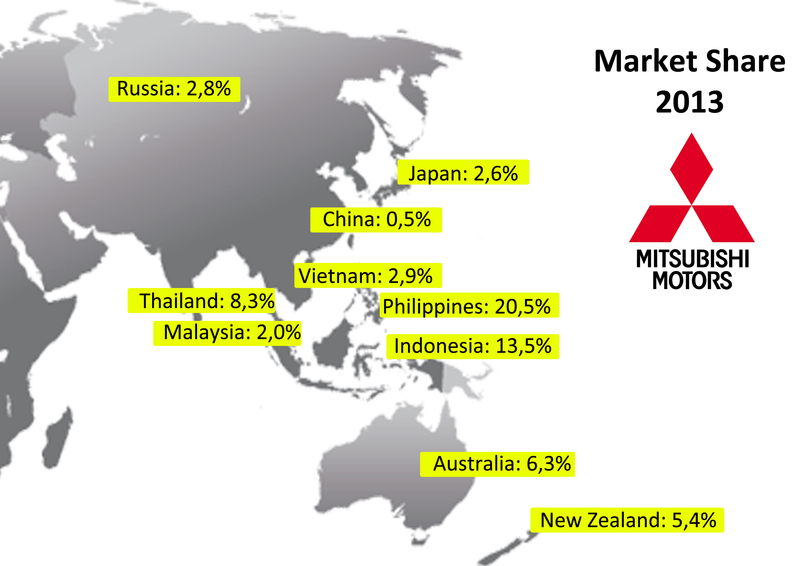 Mitsubishi is strong over there with Southeast Asia counting for a quarter of its global sales. Last year Mitsubishi Motors sold around 1,5 million units world wide, which is less than what Fiat brand sold. Adding China, Japan and Australia, Asia-Pacific region would count for more than 40% of its global sales. In 2013 the Japanese auto maker sold 108.000 units in Thailand, 153.000 units in Indonesia, and 43.000 units in the Philippines (+18%). In other markets such as Vietnam it sold more than 2.000 units, and 13.000 units in Malaysia. In Australia it occupied the 7th position with 72.000 units sold, while in New Zealand they sold 6.000 cars. In China the brand is sold under Soueast brand in association with 2 Chinese manufacturers. The brand sold 97.000 units. Russia, USA and some African markets are also important for Mitsubishi. ASEAN markets are expected to have a sales boom in the coming years, and Mitsubishi is one of the main players. Fiat needs more presence over there, and Mitsubishi can be a good solution. The bad thing is that both car groups aren’t strong enough neither in China nor in India. Therefore, is Mitsubishi the right partner for FCA? My Best wishes to FCA. Mitsubishi is another victim of Daimler’s bad management. Their cars are excellent and the Chrysler/Mitsubishi collaboration existed for almost 40 years, including at the height of anti-Japanese sentiment in the US in the 70s. Their recent difficulties really result from the fact that they had their eggs in the US and Chrysler basket – which turned sour during the Daimler-Chrysler marriage. FCA should absolutely seek a tie/up with Mitsu. It would be the recovery of a historic partnership and complementary to FCA’s current operations. Yes, Mitsu is not strong in China, but their presence in many Asian markets, combined with FCA products, would be a good base for expansion of both lines. One more point: It is just possible – given Mitsu’s small market share in most areas, that a tie-up with the Diamond would not particularly annoy FCA’s joint venture partners Mazda and Suzuki. You’re right Pietro. Mitsu could be an interesting partner but at the same time it wouldn’t give FCA the volume it needs to better face the competition from VW, Toyota and GM. I believe the marriage between FCA & Mitsubishi and excellent opportunity to cater its services to Asian market and some up-markets in Europe & the US. My best wishes to JV.